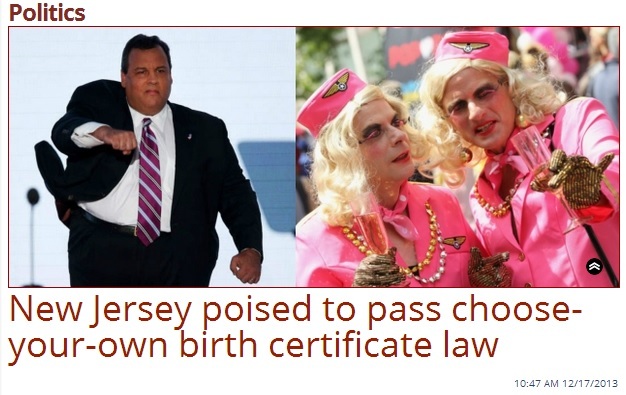 The Daily Caller derided a New Jersey bill that would allow transgender people to change their birth certificates to accurately reflect their gender identity, running the story with an image of drag queens and dubbing the bill a "choose-your-own birth certificate law." Proposed legislation winding its way through the New Jersey state legislature will, if passed, require health department officials to provide new birth certificates to people who decide they want to change genders, regardless of whether they've actually undergone any kind of gender reassignment surgery. Essentially, explains The Advocate, the prospective law allows people who receive hormone replacement treatment to get a brand-new birth certificate reflecting a gender they totally didn't have when they were actually born. The person seeking the new birth certificate would only need to submit an affidavit signed by a medical provider verifying the hormone treatment. ACLU representative Jeanne LoCicero claimed that transgender individuals often face "severe and latent discrimination" and "the risk of violence." While LoCicero did not elaborate on how having a new birth certificate would mitigate the risk of violence, she did note that transgender individuals sometimes obtain passports showing their gender preference because the State Department's lax requirements don't require proof of surgery. Though Owens apparently prefers to snark about whether or not the bill would have a direct impact on the disproportionate rates of harassment and violence faced by the transgender community, he omitted the most essential reasons for allowing transgender people to have birth certificates that reflect their gender identities. As Lambda Legal explains, not only does allowing the change affirm an individual's identity, it also provides the proof of gender that's required for many documents and other forms of identification. That Owens chose to mock transgender people and their allies -- complete with a drag queen image - isn't surprising. He has used his Daily Caller position to become one of right-wing media's most shameless promoters of transphobia - which, in turn, fuels bullying and violence against transgender people. Serious media organizations might pause to reflect on the impact such reporting has on real lives, but when it comes to transgender issues, The Daily Caller has made clear it's proud of its ignorance. Daily Caller Mocks Transgender Students "Running For Homecoming King, Queen, Whatever"